The 360 miles of Oregon's Pacific coast include many beaches, dunes and estuaries, but the majority is rocky; steep cliffs, small islands, sea stacks and other resistant outcroppings, often eroded into arches, caves, pinnacles and ridges. These rocky shores are most spectacular and continuous towards the south, from the California border to Barview near Coos Bay, north of which the cliffs are replaced by the largest expanse of sand dunes in the state, contained within Oregon Dunes National Recreation Area. 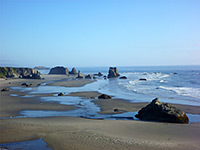 For a hundred miles south the coast is little developed, with only four significant towns (Bandon, Point Orford, Gold Beach and Brookings), yet shoreline access is generally easy, as the main road (US 101) runs beside or close to the ocean, and various side roads and trails lead to specific areas. 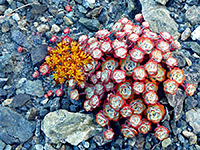 The most scenic places are protected as state parks, all free to enter, though the majority of the coastline has no particular designation, and some is privately owned. All the offshore rocks and stacks - some 1,400 of them along the whole coast - are part of Oregon Islands National Wildlife Refuge, and no access is permitted, in order to safeguard the birds, plants and animals who live here. The coastal landscapes are fascinating to explore - often without any other people around, and are excellent for photography, offering both large scale vistas and smaller features. 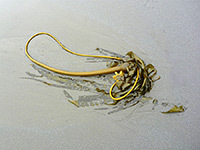 The variety of habitats include beaches, rock pools, sea stacks, succulent-covered hillsides, sand dunes and eroded rocks, in particular the unusual 'tafoni', where sedimentary rocks weather to form strange potmarked structures. 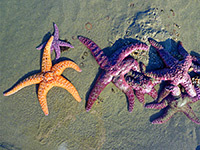 Wildlife is quite varied, with gray whales visible at some times of year, seals and sea lions on the inaccessible rocks just out to sea, urchins, sea stars, crabs and anemones in the rock pools, and many kinds of birds. Although broadly similar, no single area is exactly the same, since differences such as rock type (igneous or sedimentary), cliff height, extent of sand, angle of the sea bed and curvature of the coast create an endless variety of scenery, enough for many days of exploration. The only negative aspect is the fog, which can obscure much of the coast for days at a time. The southern rocky shores start near Coos Bay/North Bend, just beyond the south edge of Oregon Dunes NRA; the dead end Cape Arago Highway follows the coastline a little way, past Gregory Point to three adjacent state parks (Sunset Bay, Shore Acres and Cape Arago), occupying parts of a wooded promontory formed of inclined, layered rocks that at the water's edge have eroded into spectacular reefs, ridges and terraces. This is one of the most beautiful locations along the coast and is quite popular, in part due to an easily-reached sandy beach at Sunset Bay, and botanical gardens at Shore Acres. 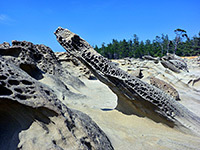 The cliffs and rocks extend southwards a few miles then give way to a long beach (contained within Seven Devils State Recreation Site) that stretches all the way to the Coquille River at Bandon. Just south of here are another two scenic and well known locations; Coquille Point and Face Rock Beach, this latter a wide, flat, sandy expanse sprinkled with large, isolated rocks, surrounded by pools and containing several caves; a favored location for photographing the sunset. 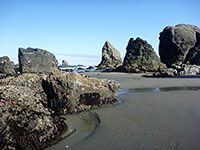 More rocks are found at intervals further south, before the sands predominate for the next few miles (including Bandon State Park), and US 101 moves quite far inland, to avoid some lagoons and wooded areas. The next rocky promontory is within Floras Lake State Park, where a 1.5 mile hike through the dense coastal forest reaches Blacklock Point, a particularly remote and beautiful area of beaches and rocks, while a little way beyond, a side road leads to the grassy slopes of Cape Blanco, surrounded by sheer cliffs and home to a picturesque lighthouse. 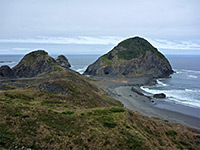 The point is within Cape Blanco State Park, as are several miles of beaches and cliffs to the south, but there are few rocks and the landscape is not so interesting. After the Elk River, the land rises once more to Port Orford Heads - a partly wooded promontory where the land slopes steeply down to inaccessible coves and islands, viewable along a short loop trail. The site is also notable for a historic lifeboat station, open to the public. 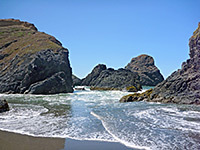 The nearby town of Port Orford has a nice beach, and the scenic Battle Rock. US 101 stays close to the ocean for five miles south but veers inland to avoid 1,756 foot Humbug Mountain, whose southwest face slopes down to sea level over less than half a mile. For the next 25 miles south the highway passes assorted beaches, rocks and small peninsulas, including such locations as Lookout Rock, Arizona Beach, Sisters Rocks, Otter Point and Gold Beach, until the land climbs again to Cape Sebastian, one of the highest, windiest and most sheer-sided points along the coast. The south face harbors a sheltered inlet (Hunters Cove), and the coast stays sandy for several more miles, through Pistol River State Park and on to Crook Point, site of another lonely, scenic group of rocks and coves, which lead to Mack Reef - more offshore rocks, many large, and including Mack Arch, a wave-cut opening in an island one mile out to sea; an iconic Oregon image though one hard to view, since the shoreline opposite is in private ownership. This inholding extends a couple of miles, before the start of Samuel H Boardman State Scenic Corridor, at 12 miles the longest preserve along the southern coast. The majority of the shoreline is not accessible since spruce-clad cliffs rise up to 400 feet above the ocean, plunging down to tiny, hidden coves and lined by many rocks, arches and sea caves. US 101 passes a dozen or more viewpoints, some with short paths to secluded overlooks. The cliffs finally relent near Brookings, where Harris Beach State Park has nice sands and scattered rocks, and the land forms another pretty promontory at Chetco Point. 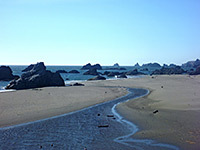 The Chetco River meets the coast on the south side of town, followed by a few miles of cliff-side residences and then one other recreation site (McVay Rock), before the California stateline, soon after which the land becomes flat and sandy, staying that way for 12 miles to Crescent City at the north end of the Redwood Coast.